The weather has changed drastically this week. It was in the 90s during the week, started cooling down on Friday afternoon, and by Saturday, it was autumn. The sky was grey and it was cold and damp. The change was a little unsettling, going from that expansive summer feeling to that poignancy that comes with this season. I felt the nesting, domestic urge rearing its head. I had been working really hard all week during the heat wave, and hadn’t had a chance to get food. I had a mean craving for squash. On Saturday, I went to Rainbow and bought all of my favorite fall foods: squash, pumpkin, pecans, walnuts, mushrooms, cauliflower, and tons of root vegetables. Dave made this pumpkin when I got home, really simple, he just scooped out the seeds and poured in a can of coconut milk. 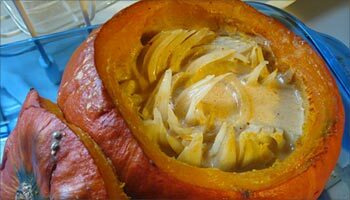 We had these sweet onions, and he cut one up and baked it inside the pumpkin with the coconut milk and some Thai red curry paste. It was a special kind of pumpkin, but I can’t remember what kind, I’ll post when I figure it out. It was delicious! In Ayurveda, autumn is the time of Vata, the dosha of air and wind. It’s a time when it’s really easy to get dried out. Too much Vata can also cause insomnia and affect the nerves. I notice that I have some of the same complaints every year around this time, my eyes feel dry and irritated, and my skin is much drier in general. 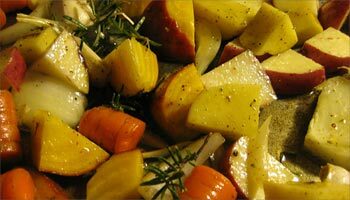 It’s a good time to eat moist, well-cooked foods with some oil or ghee. Here and here are some more in-depth Ayurvedic suggestions for autumn. Kichdi during the cooking process. It will be drier when finished. 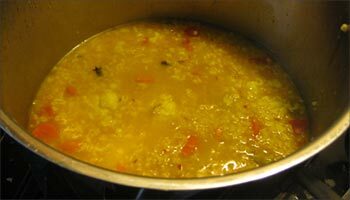 One of my favorite Ayurvedic healing foods is Kichdi, or Kicharee, with numerous other spellings. This is one of the foods that I feel I should be eating more often than I do. It’s often used for fasting and convalescing, but is also a basic comfort food in India. I hadn’t made it in a while, but I woke up this morning with a strong craving for it, and decided to sort through some internet recipes and make my own amalgam. Basically it’s a nourishing porridge of mung beans and basmati rice, with well-cooked veggies and spices. I like mine a little spicier than usual, and a little wetter than many versions. Meanwhile, I cut up the veggies I had, a couple of carrots, some brussels sprouts, cauliflower, couple of leeks. When the rice and mung were done soaking, I drained them, put in a big pot with 6 cups water and the veggies. I brought to a simmer and turned way down. Then I heated the ghee, and basically followed Sailu’s advice for the spices, heating the cumin, then adding cloves once they started popping. Then I added some really nice chopped fresh ginger. Once that was browning, I added some hing (asefoetida) and turmeric powder. I always put in a little too much turmeric because I love the color and feel like it’s so good for me. I had a big bag of tomatoes from the garden, but there were a couple of volunteer tomatoes on my porch that were perfect for cooking, so I added them to make the paste, making sure not to burn. I then added this to the pot with the rice/mung, using the water from the pot to get all the spicy goodness, added some coriander and garam masala, and let it cook for a while longer (about half an hr more at really low heat), adding salt and pepper to taste at the end. Sometimes I garnish with cilantro, but I didn’t have any today. Dave had made some yogurt, so I added yogurt and brinjal pickle, and had it for brunch. So nourishing. I will have plenty for a couple of meals tomorrow as well. I feel healthier already! The thing I like about Kichdi is that, like compost, it’s hard to get it wrong, you use whatever veggies you have, and can make it with different textures, and it’s always good and nourishing. 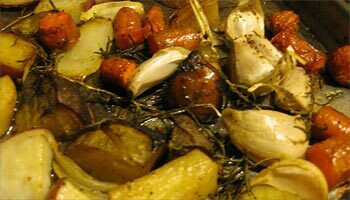 This is getting pretty long-winded, so I’ll just share some of the pictures of what else I made, here’s a before (above) and after (below) picture of roasted root veggies: carrots, garlic (2 bulbs), golden beets, yukon gold and russet potato, onions, and plenty of rosemary and olive oil. 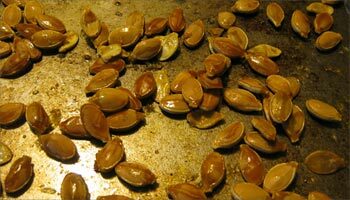 And last but not least, roasted seeds from the pumpkin. Mmmmm.